Do you have an idea for a reference SMARTbook related to military doctrine or the instruments of national power (D-I-M-E: Diplomatic, Informational, Military, Economic)? Are you a subject matter expert or thought leader in a particular field? Would you like to be a SMARTbook author or contributor? Do you already have a book or a manuscript that you think would fit well into the SMARTbook series? We’d like to see it! The Lightning Press accepts submissions from both authors and literary agents. Before sending any materials, it is always best to submit an email of inquiry that introduces the topic; briefly outlines the author’s project; and discusses relevant competing works, the potential market, the availability of the complete manuscript (or its likely completion date), and the manuscript’s (tentative) length. To obtain a better idea of our publishing program, authors and agents are urged to review The Lightning Press’s complete catalog and browse our Web site. 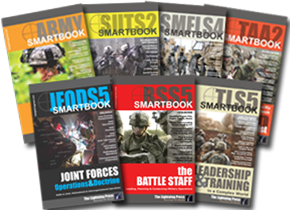 SMARTbooks can be used as quick reference guides during actual operations, as study guides at military and government education and professional development courses, and as lesson plans and checklists in support of training. Serving a generation of warfighters, national security, and government professionals, reference SMARTbooks have become “mission-essential” around the world. Please include a current CV or brief biography of your writing, teaching, military, government professional and/or educational background and experience. Be sure to list any books that you have previously published, and any other information about yourself on why you are qualified to write this book. Please allow at least 6-10 weeks for the manuscript proposal evaluation and review process. We will contact you as soon as we have had a chance to thoroughly examine your manuscript proposal. Thank you for your interest in The Lightning Press. We look forward to reading your materials.